The aborigines of Australia have been using tea tree as a medicine for over 30,000 years. They’ve long known that it can heal wounds, stop infections, treat burns, moisturize dry skin, and give the body a little extra energy on a hunt. When Captain Cooke and his crew arrived in 1770 they dubbed it the “tea tree”. Cooke and his men made tea out of the leaves, and later mixed it with spruce leaves and made a beer that kept the men happy as well as a little tipsy. The medicinal properties of tea tree oil actually remained a secret until the 1920s. That’s when Dr. Arthur Penfold researched the antiseptic qualities of the oil. In 1929, Penfold, along with another F.R. 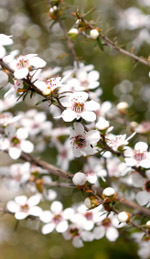 Morrison, published “Australian Tea Trees of Economic Value,” and that work stimulated a large number of research projects that focused on the medicinal properties of tea tree oil. The work was important enough for the Australian government to issue tea tree oil as an essential oil in armed forces first aid kits during World War II. After the war, tea tree oil lost some of its appeal thanks to pharmaceutical antibiotics, but in the 1960s, tea tree oil regained its popularity not just in Australia, but all over the world. The most promising new function of the oil is to help treat the MRSA (methicillin-resistant Staphylococcus aureus) antibiotic-resistant super bug that attacks people who have wounds. A Thursday Plantation in vitro study at East London University compared Vancomycin with tea tree oil, and the oil was considered a powerful alternative. In 2002, research reports showed that tea tree essential oil performed better than certain antibiotics used to fight MRSA. Ongoing studies also suggest that tea tree oil may be beneficial in treating orthopedic infections. When tea tree oil is inhaled as an aromatherapy oil it acts as an expectorant, and helps heal throat and chest infections. Plugged noses and coughing can also be treated by inhaling the vapor of steaming hot water and 5 drops of oil. If this procedure is done quickly enough it can stop the spread of infection. Tea tree oil’s healing powers are boosted even further when it is combined with other Australian antiseptic and expectorant oils such as eucalyptus and niaouli oil. Tea tree oil has an assortment of powerful ingredients, and that’s the main reason it has such an impact on fungal infections. A random but controlled study published in the Journal of Family Practice reported that a twice-daily application of tea tree oil helped people with toenail fungal infections. The trial showed that tea tree oil was as effective as the pharmaceutical antifungal cream used in the study. This entry was posted in Essential Oils and tagged antifungal essential oil on August 13, 2010 by Keith Cleversley.